Need help? Choose the Air-Tite holder model (Ring Fit vs. 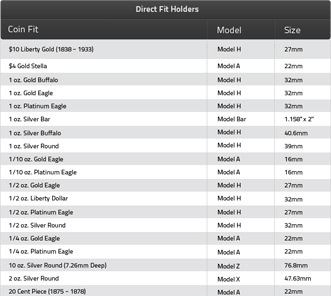 Direct Fit) for a helpful sizing grid, coin type and model information. 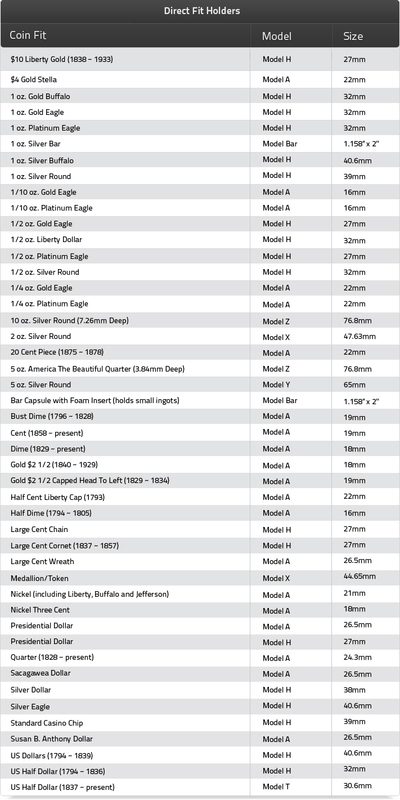 Helpful tip: Measure the inside diameter of your coin to pick the right Air-Tite holder. Air-Tite coin holders are used by coin collectors worldwide to protect their collections against wear and tear while being able to enjoy the magnificence of every coin through Air-Tite holder’s transparent plastic cover. Air-Tite coin holders are designed in a way to allow full visibility of coin’s both sides and even the outer rim for select coin sizes. Airtite coin holders are made of 2 pieces of plastic (non-yellowing acrylic) that are extremely durable, crystal clear, PVC-free and snap shut. Air tite holders come in two different flavors: Direct Fit and Ring Fit. 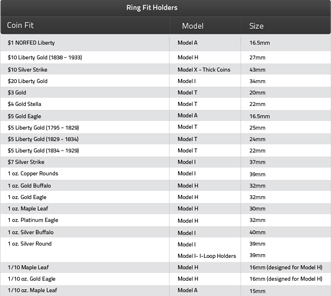 The difference between Direct Fir Air Tites and Ring Fit Air Tites is the additional foam ring (made of Volara foam) within Ring Fit Air Tites that’s designed to provide collectors with additional sizing flexibility to fit any coin. Foam rings usually come in 5 different colors: white, black, red, green and blue.